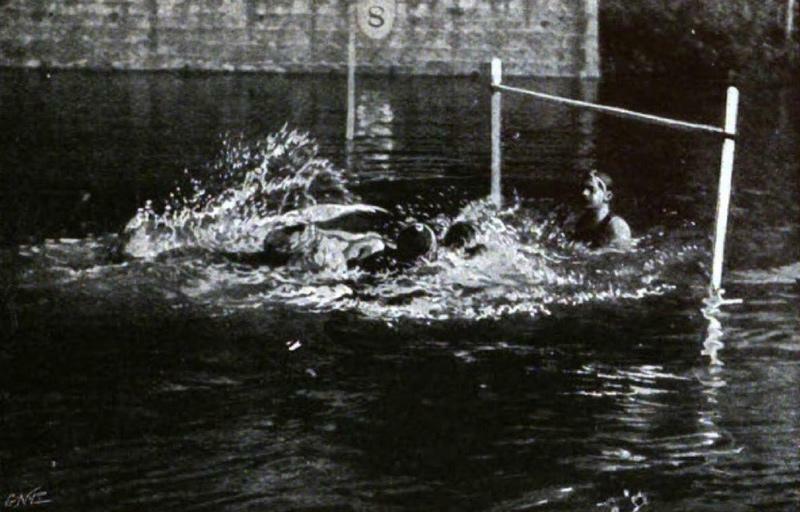 Water Polo by Albert H. Broadwell. even minutes each way, or fourteen minutes with three minutes interval at half-time, is a total duration of water polo match. Short though the allotted time may seem, the excitement is fast and furious, and so is the swimming. 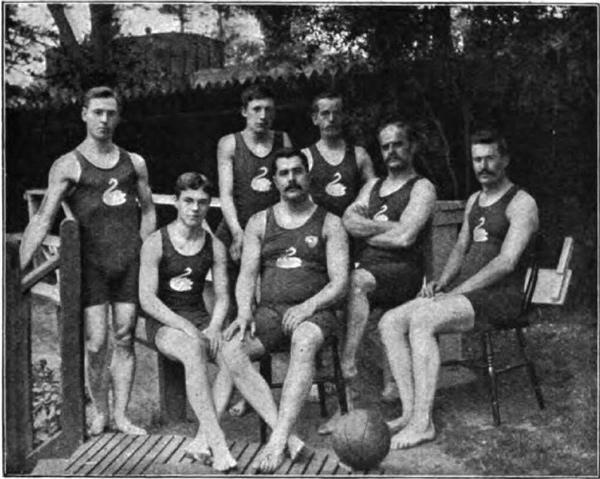 The Cygnus Swimming Club of Tunbridge Wells, captained by Mr W. Tyrell Biggs, who also acts as hon. secretary, owns one of the finest open-air baths in the kingdom, and it was through the kindness of Mr Biggs and the other members of the Cygnus team that we were enabled to obtain the wonderful snap-shops reproduced here with – a series which gives an excellent idea of the game wherever played, as the rules of different clubs do not differ materially. The members of the 'Cygnus', according to rules, number seven; we reproduce a group of the team, with Mr Biggs in the centre. The game as a whole is not unlike a football match. The 'kicking' is done with the fist, and speed in swimming is essential. The goalposts are 10ft apart, the cross-bar being about 3ft above the water. There are a referee, who stands onshore midway between the goals, and two goal-scorers, who stand one at each end of the 'field'. In the picture below the players are shown in the act of 'lining up' preparatory to a start. Look at the picture entitled 'Go', and here you have one of the most important moves in the game. The snap-shot was taken a few seconds after the referee had thrown the ball into the centre of the field, shouting 'Go'. It shows the whole of one side and two of the opposing side nearing the ball at top speed. Who will reach it first? The tension is great – for an advantage may be readily gained by obtaining the ball first. 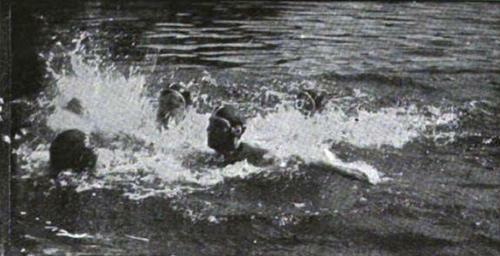 It may be seen floating between the first and second man on the left-hand side of the picture. The following illustration shows that it has been reached and is being 'dribbled' towards the opponent's goal. In 'Nearing the Goa'l the head of the ever watchful goal-keeper can be seen, photographed as it was bobbing up and down like a cork between the goal-posts. Will a dexterous blow send the ball flying through his posts, or will you be able to parry in time? 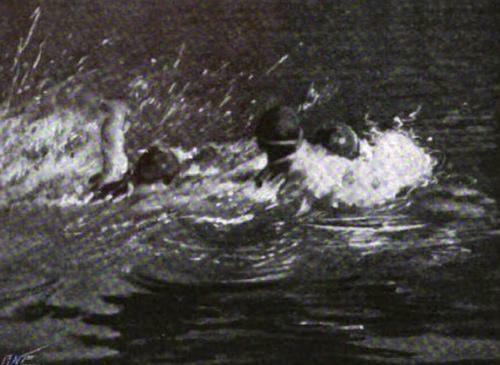 The next picture shows that he need not fear; the ball is being 'dribbled' oversee the other side, and then has reached the opposing goal, where the fight is over most exciting nature. 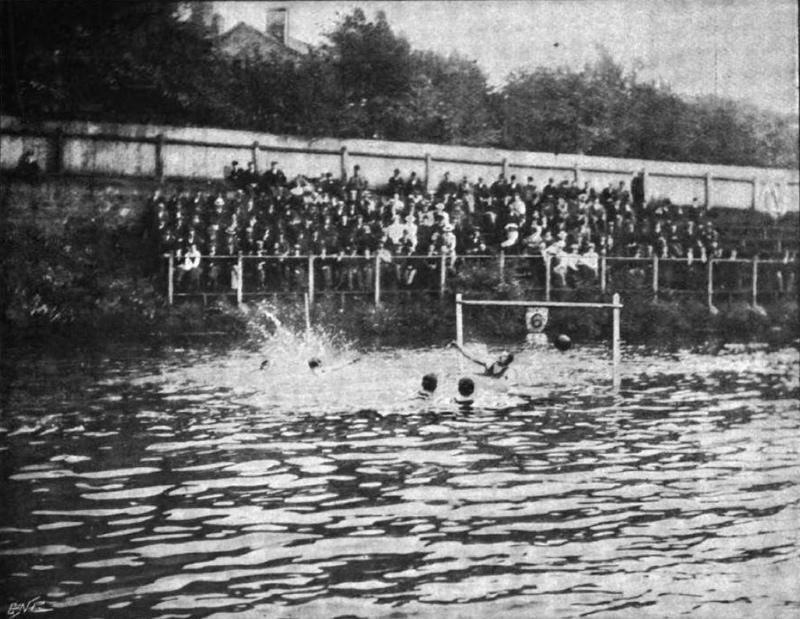 The goal-keeper is well out of the water; he cannot afford to lose sight of the ball for a moment; a hit – whizz – and up goes the ball – bang – and it is parried with wonderful accuracy right over the heads of the combatants towards the middle of the 'field'; there it is caught again and brought back; whizz again and, hurrah! the parry comes too late; the goal-keeper's arm has failed him, it falls back as though ashamed of itself, and a goal is scored. We would call special attention to this particular illustration; the ball can be seen actually flying through the goal-posts – a piece of snap-shotting which does considerable credit to the man with a camera. It may not be uninteresting to quote here one or two of the more important rules of the game. 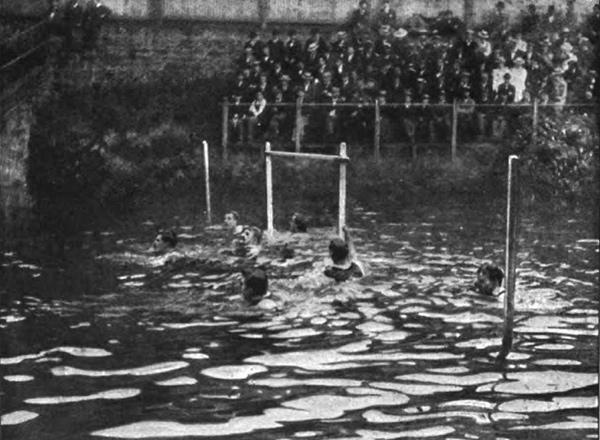 For instance, as regards starting, we note that very specified arrangements are forthcoming, namely: 'The players as will be perceived from the above, the rules in water polo are as stringent as those in football shall enter the water and place themselves in a line with their respective goals. The referee shall stand in line with the centre of the course, and having ascertained that the captains are ready, shall give the word go, and immediately throw the ball into the water at the centre. A goal shall not be scored after starting or re-starting until the ball has been handled by an opposing player or by a play on the same side, who shall be within half distance of the goal attacked; the ball must be handled by more than one player before a goal can be scored'. 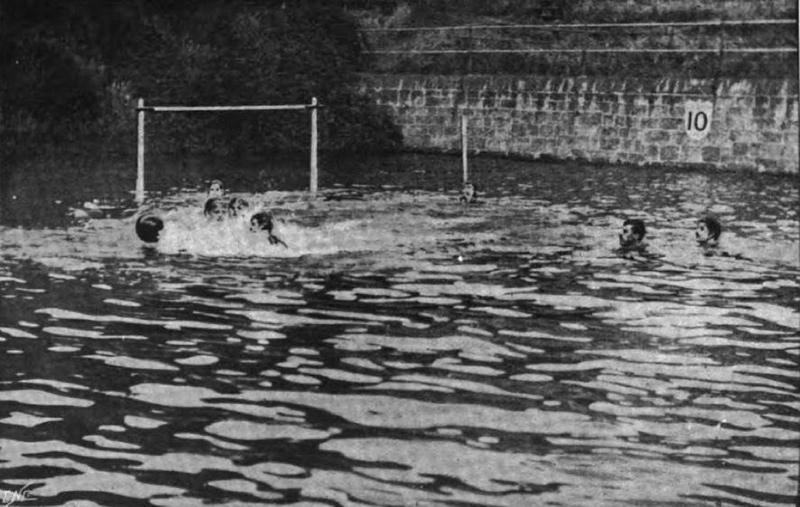 As will be perceived from the above, the rules in water polo are as stringent as those in football or cricket. Furthermore, 'when the goal has been scored, the time from the scoring of the goal to the re-starting of the game, or time occupied by disputes or fouls, shall not be reckoned as in the time of play', which excellent provision therefore insures a full fourteen minutes play. 'Half-time' says the referee's whistle. Our heroes may rest for three minutes if they choose; they are eager for a fresh start, however, and we witness some exciting scrimmages. Look at the three pretty snap-shots taken whilst the fight for the coveted position of the ball was strongest. 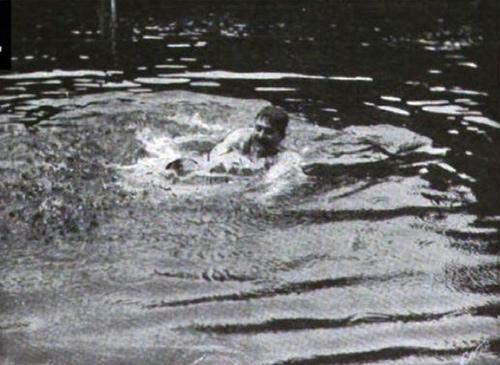 It is almost impossible to follow the bobbing thing as it is submerged, caught, snatched away and submerged again. But the cameras eyes quicker than the spectator's; it gives undeniable proof of excitement and hard work. The illustration on the next page shows a splendid 'pass' from one player to another of his own side in the distance. Here again the ball is caught by the camera in mid-air not more than a second after it had left the fist which has sent it on its errand of victory. It may here be added that the ball is an ordinary Association ball. 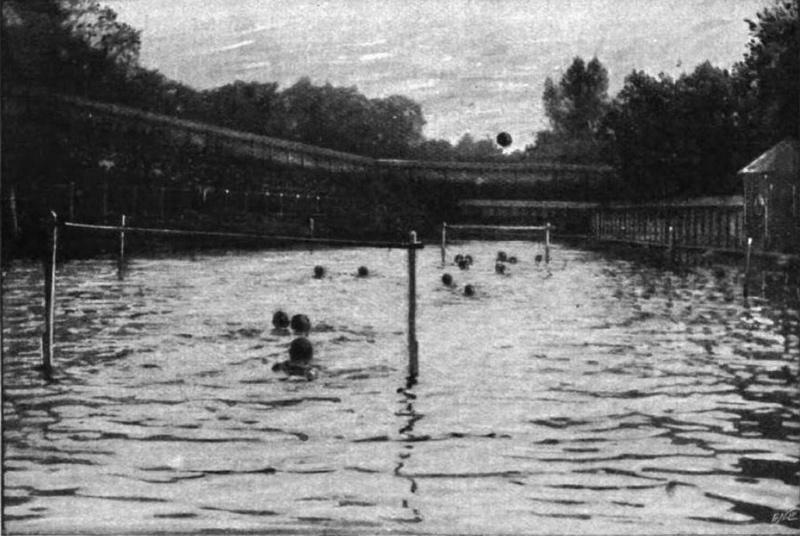 The rule says:' the ball should be waterproof, with no straps seems outside, and no grease or other objectionable substance on the surface'; one other interesting rules says; 'in the baths, no grease, oil or other objectionable substance shall be rubbed on the body'. In the picture entitled 'A Long Throw from a Scrimmage' the right arm of the player in the centre may be distinctly seen fully stretched out after the blow. The posts, which are shown standing out of the water, are the boundary posts; there used to mark the half-way line and also the penalty lines on the sides of the field. 'Should a player send the ball out of the field of play at either side, it shall be thrown in any direction from where it went out by one of the opposing side, and shall be considered a free throw', says the 'Out of Play' rule, and there is no doubt that this provision is a very useful one; the field of play being necessarily somewhat limited, the case of the ball getting outside the proper boundaries becomes a somewhat frequent occurrence. The illustration on the next page, justly entitled 'A Grand Throw', gives an excellent idea of the whole bath, and consequently of the 'field of play' also. The throw, which is a magnificent one, was however of no avail. In the photograph the ball is shown in midair in the act of passing over the goal-posts the opposing side, and as the rule says that 'a goal shall be scored by the entire ball passing beyond the goal-posts and under the cross-bar', this pretty piece of work is useless, save for the wild enthusiasm and applause of the excited spectators. We now come to an amusing little picture which illustrates a 'foul'. The playfulness and good humour of the combatants were shown repeatedly throughout the match. We cannot say we have ever seen the slightest inclination to roughness or ill-feeling, though the little episode shown here is not of the mildest kind imaginable. There are really two players at work here, but, alas! one of them has to be kept out of harm’s way until the ball is rescued by a third man, coming on at full speed, but not shown in the picture. The successful party seems highly amused at his exploit; happy smile indicates his feelings. Does the other man smile too? We doubt it. Mr Broadwell was obviously inspired by this as he return a year later to write an article on the Top Hat, Clothes and Umbrella race.